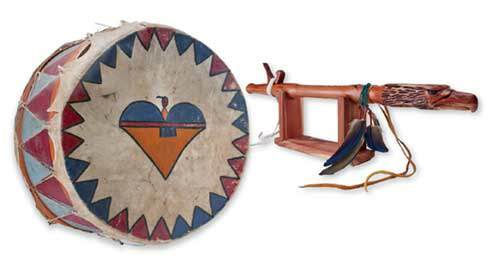 “Beat the drum once to enter a world of music as spirit.” So reads a sign on a gallery wall at the Museum of Indian Arts & Culture in Santa Fe, above a large wooden drum with a taut animal-hide top and two wooden strikers. The invitation is sincere—and the world that awaits the visitor is one worth exploring. Heartbeat: Music of the Native Southwest is an exhibition that not only honors the traditions of song and dance that link today’s Southwest Native peoples to their ancient past, but also underscores the need to preserve those traditions at a time when more and more indigenous oral traditions are being lost. Grammy Award–winning Taos Pueblo musician, composer, and instrument craftsman Robert Mirabal, who contributed one of his handmade flutes to the exhibition, stresses that music may be one of the only ways to ensure that future generations of Native Americans can hold on to some of their most time-honored traditions. “Music was always the life force of Native society, our expression of trauma, process, love, and beauty—everything,” Mirabal says. “It was like food for the spirit. And it still is. Our music and dance through the ages conveys this better than any sort of linear academic writing or simple visual display. Our music has to be experienced, not studied, to appreciate our ancient connection to it. Heartbeat curator Tony Chavarria (Santa Clara Pueblo), who has assembled more than 100 items in the main gallery from MIAC’s permanent collection as well as loaned items from other institutions, has taken pains to implement both the experiential and contemporary elements Mirabal espouses. Ranging in age of manufacture from around AD 900 to the present day, the objects on exhibit include rattles, drums, flutes, rasps, regalia, and figurines from numerous tribes and Pueblos. Drums, the cornerstone of traditional Native American instrumental music in the Southwest, dominate the gallery entry, and each one has a story. A small ceramic drum with a rawhide top made by Acoma potter Lucy M. Lewis expresses a decorative impulse, while a double-sided drum crafted from the oblong base of an aspen tree by Cochiti Pueblo artist Glenn Chalan shows musical innovation by creating a percussive instrument that makes five distinct tones. Chavarria and the Heartbeat design team knew that interactivity would be crucial in helping museumgoers scratch below the surface of Native American music. While Jemez Pueblo artist Lucy Yepa Lowden’s intricately detailed figurative sculptures of Pueblo dancers and non-Native onlookers mirror what visitors to a static exhibit might look like, Heartbeat takes things far beyond the glass display, creating a dynamic, handson experience. Listening stations with headphones allow visitors to hear samples of music and many of the instruments included in the exhibition. New samples will be added throughout Heartbeat’s run. Two screens project still and moving archival images of Pueblo and tribal dancers, while carefully positioned speakers broadcast traditional Native American songs without drowning out the gallery. A bulletin board allows guests to post questions or comments about the exhibit, which musicians, curators, and others will answer in writing. Visitors can also create their own music in the exhibition’s on-site recording studio. “You can record a piece of music using vocals, hands, or some instruments that we provide,” says Chavarria. The museum also invites you to bring an instrument from home. The museum will post some of the songs online (soundcloud.com/Heartbeatnm). Heartbeat also exhibits two stunning examples of dance regalia, positioned under a Tewa sun symbol near the gallery entrance. Still used in ceremonies today, the outfits will intermittently be whisked away from their mannequin stands and returned to their respective Pueblos to be used in time-honored dance rituals. Chavarria adds that Native American musicians, dancers, instrument makers, and other invited guests are offering performances and demonstrations over the course of the exhibition. “I think these interactive exchanges are what make this all worthwhile,” Mirabal says. “To not have them would be like going to an exhibition about food and then not being able to taste anything.” It’s important, he says, to incorporate more indigenous language into contemporary music as a way of preserving oral traditions for younger generations. Still, he worries: “How do we retain the pulses of our people and language without watering them down in more contemporary musical forms?” It’s a question that lingers on Mirabal’s tongue, although he believes that exhibitions like Heartbeat are an increasingly important piece of the puzzle.